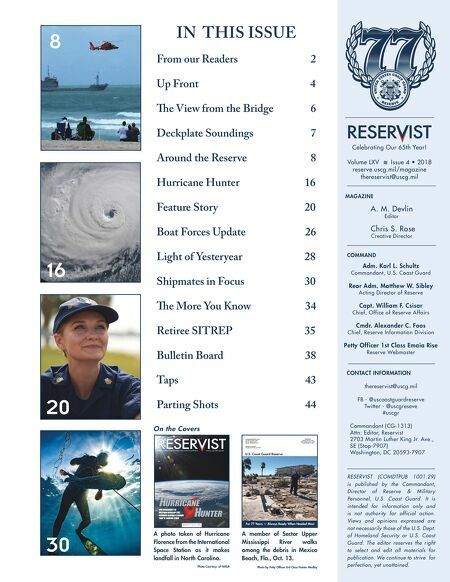 RESERVIST IN THIS ISSUE From our Readers 2 Up Front 4 e View from the Bridge 6 Deckplate Soundings 7 Around the Reserve 8 Hurricane Hunter 16 Feature Story 20 Boat Forces Update 26 Light of Yesteryear 28 Shipmates in Focus 30 e More You Know 34 Retiree SITREP 35 Bulletin Board 38 Taps 43 Parting Shots 44 Volume LXV � Issue 4 • 2018 ONE RESERVIST IS HELPING DEVELOP THE SCIENCE BEHIND STORMS THAT'S SAVING LIVES Commanding Officer (mas) Pay & Personnel Center 444 SE Quincy Street Topeka, KS 66683-3591 PRSTD STD Postage and Fees Paid United States Coast Guard Permit Number G-157 OFFICIAL BUSINESS Penalty for Private Use $300 U.S. Coast Guard Reserve For 77 Years — Always Ready When Needed Most 20 30 16 8 A member of Sector Upper Mississippi River walks among the debris in Mexico Beach, Fla., Oct. 13. Photo by Petty Officer 3rd Class Hunter Medley A photo taken of Hurricane Florence from the International Space Station as it makes landfall in North Carolina. Photo Courtesy of NASA On the Covers Celebrating Our 65th Year! Volume LXV � Issue 4 • 2018 reserve.uscg.mil/magazine thereservist@uscg.mil MAGAZINE A. M. Devlin Editor Chris S. Rose Creative Director COMMAND Adm. Karl L. Schultz Commandant, U.S. Coast Guard Rear Adm. Matthew W. Sibley Acting Director of Reserve Capt. William F. Csisar Chief, Office of Reserve Affairs Cmdr. Alexander C. Foos Chief, Reserve Information Division Petty Officer 1st Class Emaia Rise Reserve Webmaster CONTACT INFORMATION thereservist@uscg.mil FB - @uscoastguardreserve Twitter - @uscgreseve #uscgr Commandant (CG-1313) Attn: Editor, Reservist 2703 Martin Luther King Jr. Ave., SE (Stop-7907) Washington, DC 20593-7907 RESERVIST (COMDTPUB 1001.29) is published by the Commandant, Director of Reserve & Military Personnel, U.S. Coast Guard. It is intended for information only and is not authority for official action. Views and opinions expressed are not necessarily those of the U.S. Dept. 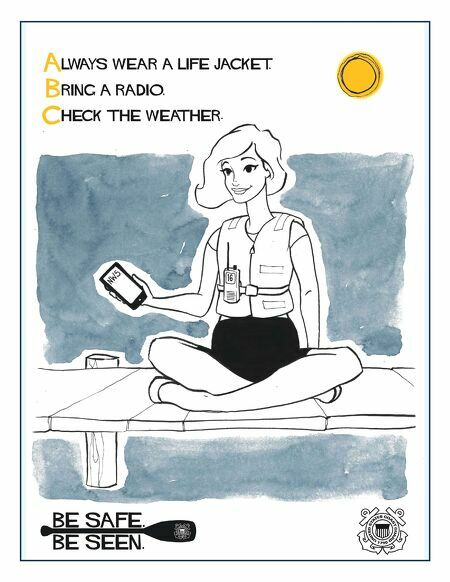 of Homeland Security or U.S. Coast Guard. The editor reserves the right to select and edit all materials for publication. We continue to strive for perfection, yet unattained.